Donald Trump is an astute political investor having donated to candidates on both sides of the aisle. However his history with donating and supporting Hillary Clinton has some conspiracy theorists wondering why threw his name in for the Republican Primary. Could it be that this was just an elaborate ruse set up by the Clinton campaign to screw up the Republican Primary. Imagine a plan to having the other candidates fall all over themselves trying to be just as obnoxious and unapologetic as Trump which could help a Hillary victory in the general election. The only problem with this theory (as well as most of the best conspiracy theories) is that it assumes a level of (a) competence (b) organization and (c) ability to keep secrets that the potential conspirators usually don’t have, In this case especially (c); between Trump’s unfiltered and disorganized public mouth and Clinton’s mishandling of REAL high security content, this conspiracy would’ve been public knowledge well before now. 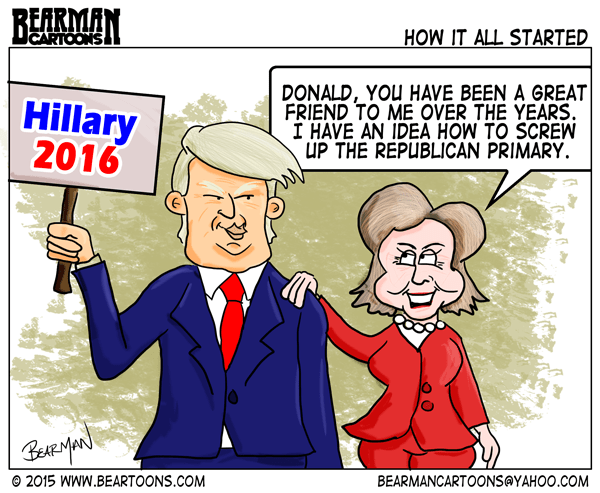 I have no idea who to choose for a political candidate, but I think you did a fine job drawing Rump and Hilary. What George said. I don’t like either one of them. I don’t like Sanders either. Not sure about the other side of the aisle. Politics is a huge dirty word anymore. Sad what the political process has become. Actually it has always been that way. I have wondered the same thing. But why does “obnoxious and unapologetic” get you the Republican vote? We go to the polls next month. An 11 week campaign, the longest we’ve ever had. Not like the years you go through! A way to have a president who will do anything for you without having to give them a cent. It would be the smartest possible hoax ever and afterwards he could say how it was “Perfectly legal” Pretty good theory. He’ll never make it through the process without blowing himself up. Marco Rubio all the way! So first I laughed, then I realized how possible this was and don’t feel so good anymore. I’m writing in Windex as my candidate next year. If nothing else we’ll have a streak free shine. LOL now it all makes sense! They’re both one of a kind. And Thank God for that!